I ended up going with a 2014 Dodge Ram Promaster. I had found it used for $11k which is what I had in savings but it did have a 170k miles on it already. But was still low priced and even though I did have to put a new transmission in it 9 months later, it was still a great deal and has served me well. My next van, will more than likely be a Ford Transit High Top. I think it just drives nicer and more comfortable. I’ve changed the layout once since my initial buildout. I turned the bed 90 degrees to allow steps for Bailey to get in the bed easier and create more open floor space. Since its just me and Bailey, I made the bed convert so it has the option to add 15 inches on the width. Doing this I allowed longer, underbed storage to accommodate surfboards that are under 6ft. I have a comfortable work space to do work on my laptop that also makes a nice L shaped kitchen. There’s no right or wrong layout and you want to build it to suit your needs. Bailey’s comfort was priority, I wanted a decent kitchen, and a computer work space in my build. I own quite a few surf and sup boards so storage is always a problem. I’m able to store smaller boards on my ceiling and against the wall to the side. I then have several inflatable boards underneath my bed with 2 shortboards in boardbags laying on top. Then for any other longer style boards I have, they are stacked on the roof rack in board bags and strapped down securely. I got my roof rack and ladder from vantech.us and its made to fit my van’s roof with the existing brackets in the frame. The roof rack is 4 sections of crossbars. I would of liked to spend more and get a wider and larger roof system. Something I will do with my next build out. 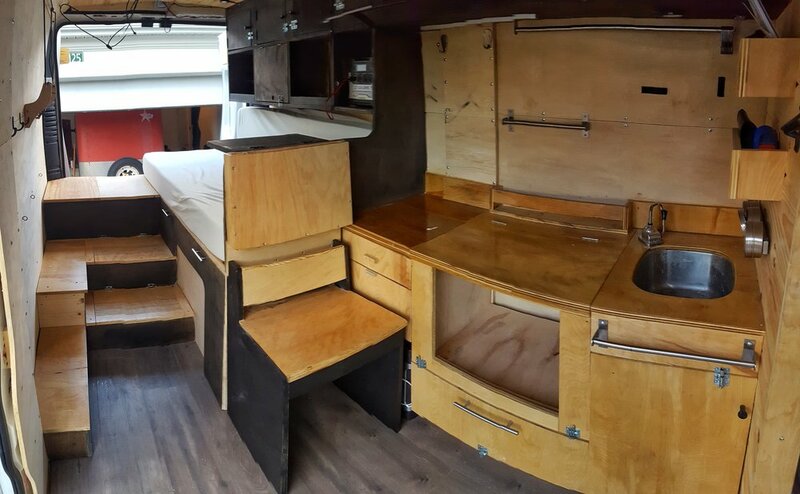 Moving in from my camper, I already had a Goal Zero 30 watt panel and Yeti 400 battery. I decided to keep with this and add 2 more 30 watt panels and a yeti 1250 battery. I basically go back and forth to which battery is charging from the panels since I couldn’t find a way to chain the batteries. Goal Zero is plug and play and does not require any kind of hard wiring which is what I wanted to make it easy. I also have the option to pull out the batteries to use in a tent or offsite if I wanted. Sad to say, I bought a Dometic CFX 50watt fridge. It worked well for 6 weeks but then the 12V went out on it and no longer worked. It did work off the 110v but that pulled too much power. I called Dometic and they weren’t much help so I do not recommend their products. I ended up with a Yeti Tundra 35 Cooler that I already had to save money and conserve power. Works well but have to buy ice quite often. Down the road, I would like to revisit another refrigerator option. 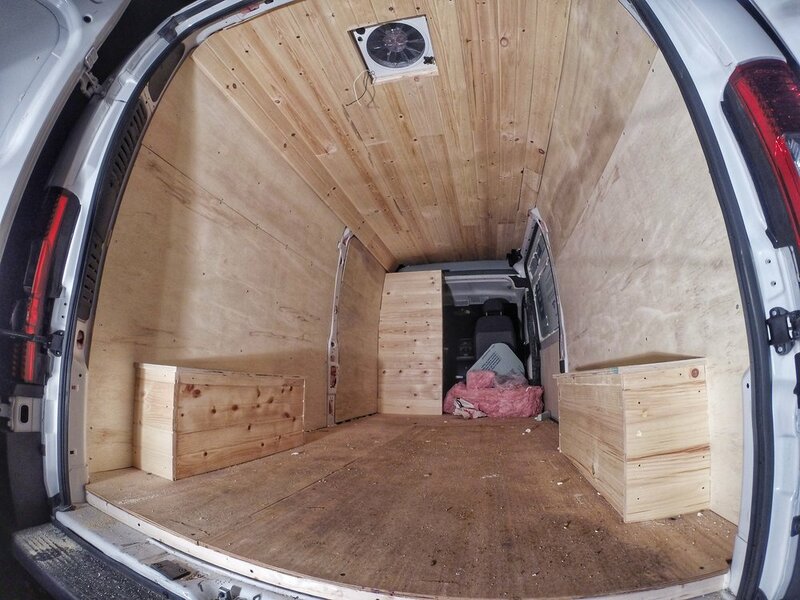 First thing I did when I bought the van was insulate with 2 inch foam insulation and then spray foamed in place all the seams and places I could. I used R30 around the wheel wells that I boxed off. 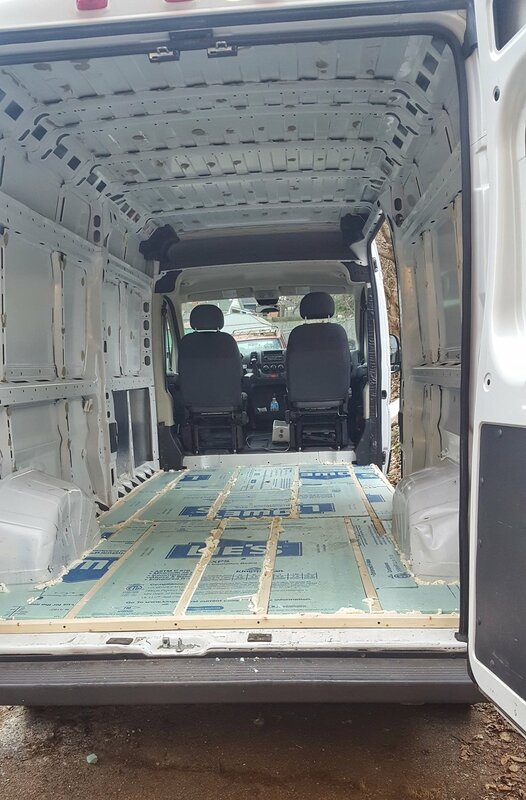 The van stays cool in the summer and can retain heat well. It also drowns out the sound very nicely. I’ve been in my napping in my van and had friends knock on the door and I didnt even hear them and I’m a pretty light sleeper. This is pretty simple but I just use my cell phone as a hotspot. I got the highest plan from sprint to allow wifi tethering and haven’t had too many issues yet. If I’m running around, away from the van, I have a Goal Zero external battery pack that I keep in my bag for emergency gopro and phone charging. I have several Ikea LED lights that can be all chained together. It’s kind of a mess with all the cords and hiding them is a pain. I probably have more light than I need but is nice when it’s dark and spend a lot of evenings in the van reading and cooking. When I want to conserve battery and don’t need much light, I will use a headlamp or my Goal Zero rechargeable lantern. This thing has definitely earned its keep. Recharges via USB and I keep it next to my bed for reading at night because its a quick turn off if I want to fall asleep and don’t have to get up to turn out the lights. I have a jetboil backpacking stove for boiling water quick or doing a dehydrated meal. If Im cooking in the kitchen, I use my camp chef outdoor camp oven with a 2 burner stove on top. It runs off 1lb propane canisters and been pretty fuel efficient. My mom got me like 12 a few Christmases ago and I havent gone through half of them yet. I also have the option to pull the unit out and cook outside if I want. Im using the Thetford Porta Potti 565E Curve. It has a 6 gallon waste and 5 gallon fresh water capacity. If you use the right amount of deodorizer and empty/clean when it needs it. It doesnt smell. It’s somewhat of a gross task but really isn’t that bad if you empty when its half full and dont wait til its all the way full. I really only use for emergencies or when its just more convenient when I’m in the middle of nowhere. The only thing is, its a battery operated flush and I may have to replace that part. But even if it doesn’t work, having a water jug handy will also do the trick. I have a Fan-Tasktic vent roof fan above the bed. If I crack the windows in the front enough, the fan will pull air from the window through the length of the van. Since I have no other windows and have windshield screens, it stays pretty dark and cool in the van, even in summer. No sun coming in is key. 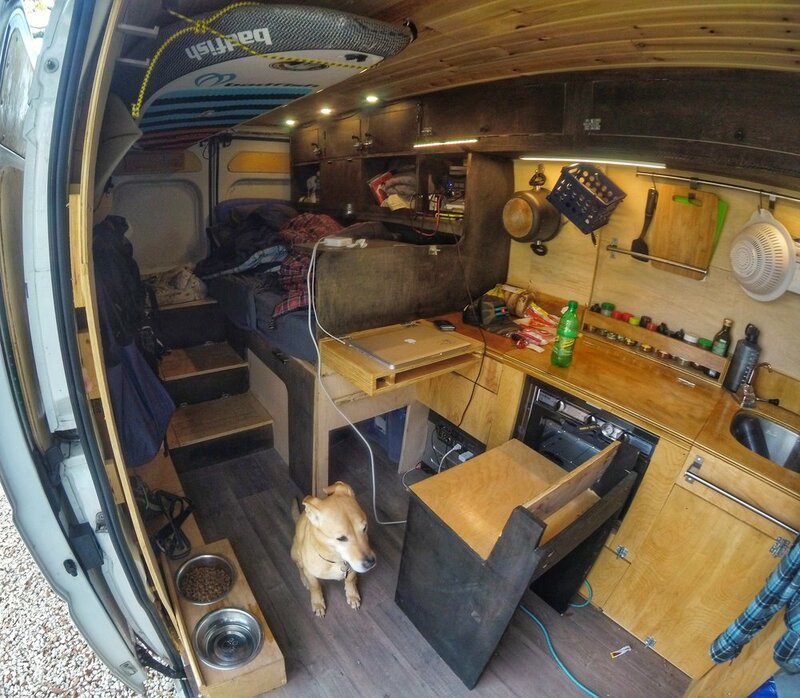 I also have an ARB awning that shades the whole side of the van as well including my boards and gear on top, adding another layer of shade. For heat, I use a Mr. Buddy propane heater but once I go to sleep, I keep it turned off. I do have an electric space heater that is great but thats only if im plugged in somewhere. I have plans to do a mini wood burning stove for my next build. I keep my windshield screen up when parked and it would be hard for someone to see inside well from the side windows. 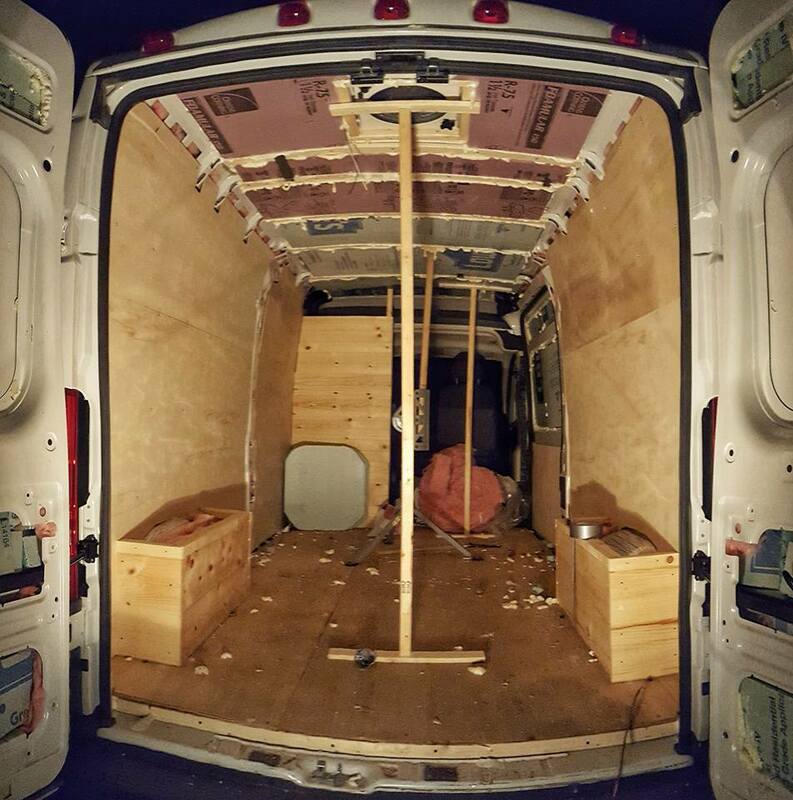 When I go to sleep, I make sure to lock the van while inside. One thing I do need is a combination lock that can house my key so when Im out surfing, I can hide the key somewhere. I can however hide underneath my solar panels on my roof or in a board bag. I use a 6 inch memory foam mattress and is plenty comfortable. Honestly I would of been fine with a 4 inch and could of saved that little bit of height. I use regular bed set but in the winter I use a 0 degree teton sports Double Wide sleeping bag that keeps Bailey and I plenty warm! Sometimes, I get the van set up a great spot, awning extended and I dont want to move it. So I bring my Bentelli Sprint 50cc scooter to zip around town, run errands, or get a quick surf session in. Yes I have a Carver surf rack for it. 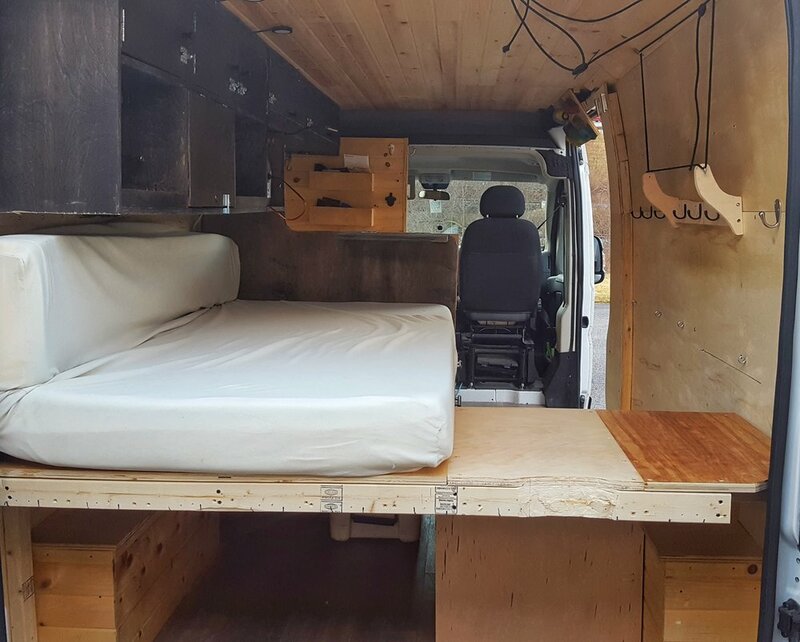 I added a hitch mount to my van and now also have the option to tow trailers if I need to. I currently have a hinged luggage rack. However, Ive found out, if i need to open up the back doors to my van, I have to take the scooter and rack off to do so. I found an extended arm mount that can hinge out the scooter rack 90 degrees allowing access to the back door storage. I plan to purchase it soon along with a new scooter rack that wont extend out as far, keeping less pressure on the hitch itself and it should transport better. Think I was 10 yrs old when I first saw the movie Point Break and thought surfing was the coolest thing I had ever seen and was disappointed that I didn't live near an ocean to try it. Over the years, i always saw surf videos from time to time or in movies and the desire to try it still gnawed at me. 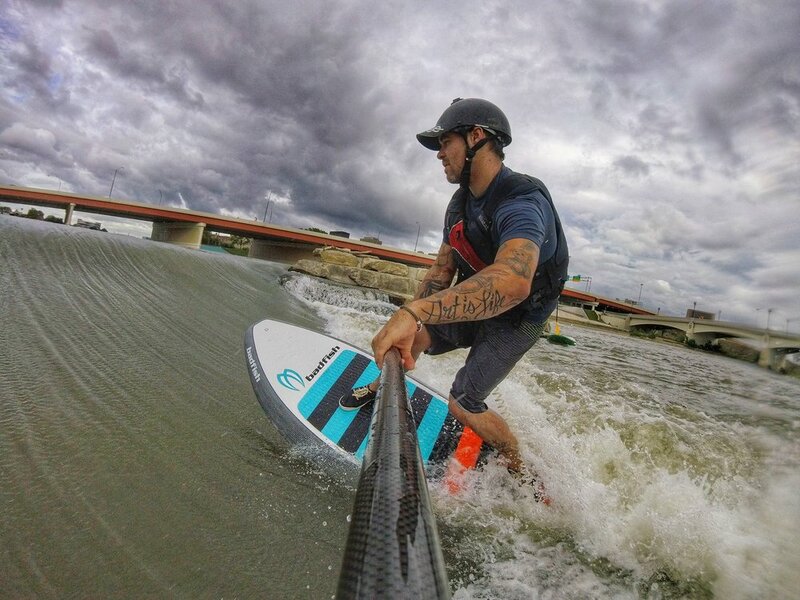 After getting into stand up paddleboarding, I discovered river surfing and how to surf these manmade whitewater features on paddleboards. Then I saw that on the right river wave, it could be surfed on actual short surfboard and recently fell in love with shortboarding these waves that are being newly built all over the country. Im only sad that I am just now discovering this love for the sport, but thankful I'm now able to surf anywhere there's a wave. When I say surfing is life, not just a metaphor. In the last few months, it's taught me a lot. Somedays you get worked but you keep at it. After a good ride, there's a unique high you get and the feeling is overwhelming. The feeling like you are home and completely in your element. When you're on the wave, you're not thinking about work, bills, or that girl that's got your heart all twisted up at the moment. Everything just gets pushed back because you are completely in the present moment and nothing else matters. Your face hurts from smiling, legs are jello, stomach is craving food, you feel like you got nothing left but it's so much fun you keep getting back in the line up for "1 more last ride." I've seen that river surfing is one of the few sports where everyone you are with is pushing each other, giving tips, cheering each other on, complimenting each other after a good ride. I often think why the hell aren't we doing more of that in everyday life. Encouraging each other, building people up, instead of tearing them down. I tend to always feel like i can take on anything life has to throw at me after a good surf session. Often when you first standup, you have got to move. Carve, pump, paddle, and push yourself as hard as you can trying to make the most of that ride and not get flushed. You'll fall off, maybe take a hard swim in the current but swim out into the eddy and paddle back into that line up for more before you've even had a chance to catch your breath! I just want to tackle life in that exact same manner. Surfing is damn spiritual and nothing else is quite like it. The Feature: This was one of the first features in Dayton built. Its changed several times and been rebuilt due to flood damage. The surfer's right wave is the main feature and is good to surf between 350-800 cfs. Anything over it begins to get flushy. There's not much drop so the wave isnt very big. I think it's the most fun around 500-600 cfs where the foam pile is the highest and retentive although Ive noticed changes in it lately and just a few cfs can make all the difference. This is a great wave to learn on and is very easy access for surfer left or right. There is also a 2nd drop that is fun to run but wave is more natural and difficult to surf with how small it is. Its about 3.5 miles down river from Eastwood so you can paddle there or just park downtown at River Scape Metropark. Located less than half a mile down river from River Scape just past the I75 Bridge. Parking is still being constructed but there is a gravel lot across from the art museum and dayton masonic temple. You can also park across the street near the temple. You then walk down the steep embankment to get to the bike path next to the feature. At flood stage at around 29', the main wave gets turbulent but a huge green glassy wave forms where the canoe chute is. Eddying is difficult and often only option is backwards entry. The swim and walk back up after can prove challenging as well. Definitely only attempt if you're a skilled paddler and surfer. Its about a 20 minute drive from Dayton but well worth it at right levels. Follow the map for Snyder Whitewater Park and the park will be on the right side, river left. Very easy to find and parking is right next to the river. Keep an eye on your belongings, reports of theft have occurred. The River: Buck Creek is a great run for some whitewater. If you want to run the whole creek, start at the CJ resevoir and paddle down to Snyder Park for a 5 mile stretch. All together there is about 10 drops to run and possibly surf at the right levels. After the creek combines with the tributary creek, you'll go through some splashy water before hitting some limestone shelves, stay river left at the first drop. The Stadium wave is fun and surfable at around 2.75-3.5ft. You can drive there as well and park and play. Next is the art museum which has 2 kayak holes but not very good for surfing a sup. Another 3/4 mile you will reach Snyder Park where there is the last 4 drops. Drop #3 is by far my favorite at snyder park and is surfable above 3.5 and most fun around 4-4.5 ft. It becomes very fast and rentantive with shoulders on left and right which makes it perfect for carving and short boards. Drop #4 is better at lower levels but washes out when its above 4ft. Can still be a fun wave to learn on. Ill try and update info and images as I get them to keep it current since rivers and features change over time. If you have additional info that I may not have mentioned, dont hesitate to comment. More info on Dayton paddling can be found at whitewater warehouse, www.kayakdayton.com where you can sign up for classes, rent, and buy gear! I'm always down for an adventure. Sure when you know ahead of time, you can pack what you need for that particular excursion. But that's a lot of packing, unpacking, loading, and unloading. It just doesn't make sense to me so I made it so I'm always ready for whatever adventure comes. Sure some things may get swapped or added, I have a few different boards I throw on top my rack for that particular type of paddling I want to do but in this photo is what I normally have with me on any given day. 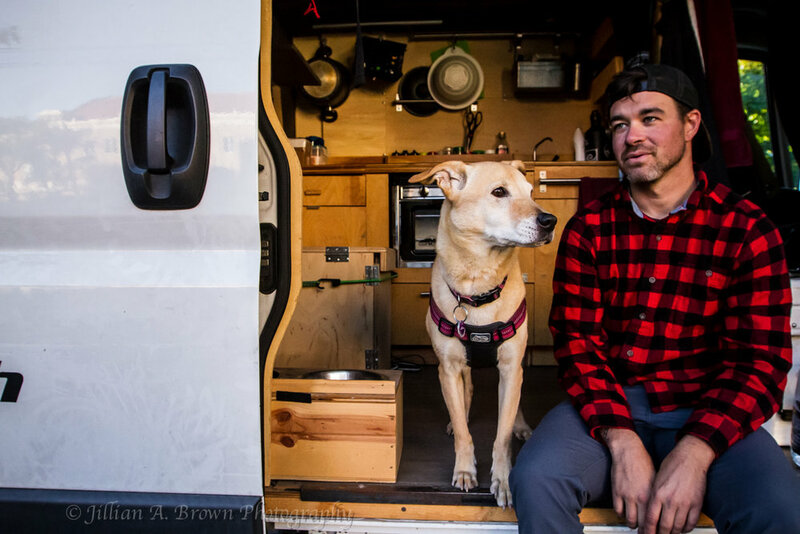 Hope it inspires you to gear out your vehicle and adventure more this summer. You never know where the day will lead or when the opportunity for an adventure will come up! 1. Vehicle- I drive a 2011 Subaru forester and absolutely love it. I have about 70k miles on it and have had to do nothing to it but routine maintenance. It's a very reliable vehicle with all wheel drive so I can take it anywhere in any kind of weather or terrain. I decided to build out a 2 part shelf for the back end to better organize my gear and easier storage. 2. BICSUP 2015 c-tec tracer 12'6 board. This board is very light and fast so when I want to go paddle my local lake or do any flatwater, this is the board I use. Great touring board or for some light racing. 4. BICSUP inflatable 9'2 River board. Probably the board I've been on the most lately. Great for running whitewater and river surfing. Very stable and solid board. I'm always squeezing in quick solo river surf sessions so this board remains inflated at 15psi and rarely have to add air. I try not leave it on my car during hot sunny days though. 5. Sector 9 longboard. Never know when you want to skate around so I always leave it in my car. I also carry the kahuna stick if the desire for land paddling comes up. 6. Kokatat Icon drysuit. I want to paddle year round and Ohio's weather can change drastically so this keeps me warm and dry in the colder months. I can throw the drysuit over whatever clothes I'm wearing which is great not having to deal with changing into different clothes afterwards. 7. Teton Sports Oasis 1200 day pack. This is my pack I take with me everywhere all day, from work, climbing, paddling, volleyball etc. I carry my laptop with me to work in it and then I take it out when I get home and usually throw a change of clothes, my gopro, nalgene, clif bars, snacks, pretty much anything I could ever need throughout the day. Honestly, I'm never without this pack. 8. Black Diamond rope bag- This holds my climbing rope, climbing shoes, chalk bag, harness, carabiners and belay device. So if I want to hit the climbing gym, I can go and don't have to worry about finding my gear. It's always there ready to go. 9. One Wheel - This is literally my 2nd vehicle. It's so much fun to ride and it's got a 6-8 mile radius so the battery lasts quite awhile. I've used it do errands around town, carving up and down bike paths, killing time while waiting for friends. It never gets old so if you see me out and about, ask to try it out! You'll be addicted quick. 10. Yakima roof rack - Every car needs a roof rack and I just traded in my old for this new yakima rack with 78 inch wide bars. (widest on the market I believe) So I can now carry boards, kayaks and both side. Im working on getting a yakima cargo carrier so I can store gear in that and still have plenty of room on the other side to stack boards. 11. BICSUP paddles - I usually keep 2 paddles, 1 of is a wider blade with gopro mount on back side I use for whitewater and river surfing because it will take more abuse. I then use a narrower blade paddle for racing or flatwater paddling so it's easier on my shoulders with less resistance, less fatigue, and able to get more strokes in per minute. 12. Trekultra Tour Camp chair- It's compact since its breaks down into a small carry case. You never know when you get invited over to a bonfire or just want to sit and relax so since I bought this a few months ago, I just leave in my car for when I could use it. It's a pretty common fact that when you surround yourself with your best friends, the jokes and antics are sure to be in full effect and more fun is surely to be had. I'm from Dayton, Ohio so there's not exactly a ton of people who Stand Up Paddle and the ones that do, I'm already good friends with. So when you decide to go out and get a river surf session in or some flat water paddling done after work, I text the people I think would want to join but we all have different lives and schedules and more than half the time, I'm going to end up paddling alone. Years ago, I would start rethinking and questioning my motivation to still go out when everyone else bailed. Majority of the time, I'd still go out and was always surprised by how much fun I still had and how satisfied I was afterwards. It's a different kind of fun, a more soul rewarding experience. I can honestly say I've never had a bad day paddling. Even when the weather wasn't the best, it's maybe rainy and windy or the wave wasn't quite at the right level to surf, I never once regretted going out by myself to paddle. Even some of my favorite river surf sessions were by myself on snowy 25 degree day. Soon I never let the factor of going by myself, impact my decision to go and decided I was going to always go out when I planned to and friends could join if they wanted. You have to just commit to yourself and your plan for the day. Some days, I need to be out there by myself and just get that peace and solitude and watch a sunset out on the lake. I've seen some pretty amazing sunsets from the water and each one is a memory I would never want to forget or change. 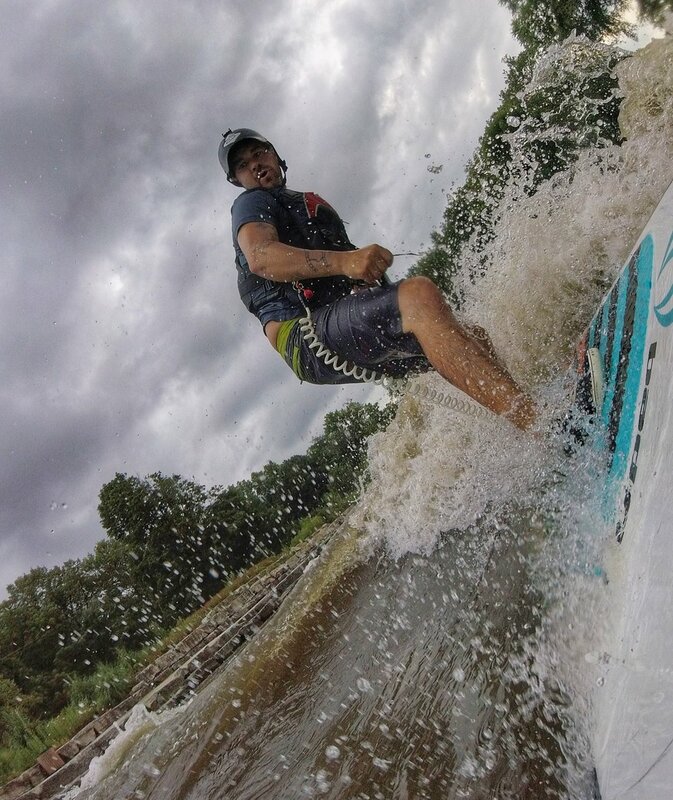 When I go river surfing, I never have to wait for my turn on the wave. I can get more surfs in a shorter amount of time, maybe try some new tricks since you're not worried about wasting your turn on the wave to just take a swim. River surfing is always going to be fun to me, solo or with friends. Even day trips down rivers, I've shuttled myself up river using a skateboard while my kayak or board was locked up around a tree at the put in. When I'm race training on flatwater, my ear buds are in, and usually I'm timing myself with each lap. It shouldn't ever hard to stay motivated doing something you love. I'm not saying that you should be a complete loner and 95% of the time, Id prefer to be out with friends paddling rather than solo. However, you should never let the fear of going out by yourself discourage you. If you love the sport, no matter what it is, you should feel comfortable and confident in doing it alone. Even if you're a beginner and maybe worried you might embarrass yourself in front of spectators or other paddlers there, everyone has to start somewhere and it's a great opportunity to meet new friends with that shared love of your sport. We are all out there for the same reason,... to have fun on the water. My favorite memories are hot and humid days, you wake up and don't even bother putting on a shirt, just board shorts. Load up SUP board, spend the day paddling down a river with friends or maybe just a solo trip using my skateboard as my shuttle. Or if it's during the week, I hit the lake right after work and get a long flat water training session before I go play sand volleyball til 1am, ignoring the fact I have yet to eat dinner or that I have to be at work by 9am the next day. It's summer. Days are longer, its always warm and sunny, and I refuse to be indoors. This lasts until the time change. There's plenty of winter athletes who thrive in winter. The temperature drops and the snow falls and they hit the mountains. I am not one of those people, yet I try not to complain. I try to make the most out of my situation. I'm in Dayton, Ohio which is quite flat. No mountains but plenty of rivers to paddle. We do have an indoor climbing gym a few miles from my house that I try and go climb 4-5 times a week for training and become a better climber and I may play in an indoor volleyball league just so I don't get rusty. Weekends I'll still try and get out to river surf if weather permitting and the playwave isn't washed out flood rains. This is still my biggest struggle since I can't paddle everyday with work until 5pm and no daylight afterwards. But if it's above 25 degrees and isnt crazy bad windy/snowy, I'll be out on the water. A drysuit is an absolute must unless you got one heck of a wetsuit and it's not too cold outside. Wetsuit or waterproof gloves are a must too. Without them, you may last 30 seconds before you can't feel your hands. Some good moisture wicking base layers, and some decent insulation layers over top that. Great part is I can park 100 ft from the playwave at Eastwood Metropark on the Mad River or drive to Springfield to their park on Buck Creek. I do have options and I'm grateful to have these spots to go. Whether its a 3 hour surf session or 30 minutes before I'm back in my car trying to thaw my fingers and toes out, Im still out there paddling. I can honestly say I've never had a bad day paddling. It beats sitting on my couch waiting for Spring, thats for sure! As a Summer river rat, that's how I survive Winter. You can always change your situation if unhappy or at least your outlook on it. Life is always what you make it. Sure we are spontaneous, full of life, and have an unquenchable thirst for adventure. We still have that child like wonder and want to be having fun exploring rivers and woods at all times. Sounds like it would be fun to date us and it usually is in the beginning. But once things get a little more serious, something will change and you won't know why. You may ask us to go away for a weekend to a wedding of someone we never met when its June and the paddling is good, rivers are still at spring levels, or its prime rock climbing season and we'd just much rather be doing that. That's usually when things start to go down hill fast. What you don't know is that we are extremely stubborn and often time unwilling to compromise ourselves and lifestyle. Truth is we enjoy our life and how we are. Granted, its hard for me to make any relationship last more than 15 minutes and at this point in my life, relationships just are not a priority. But here's some tips if you still want to date that typical adventure athlete. 1. We travel a lot. We spend weeks or sometimes months planning a trip to the middle of nowhere so we can paddle some obscure stretch of river and you'll probably get sick of hearing about it. Living room floors will be covered with gear and dehydrated meals spread out all over for at least a week while we pack. 2. We wont invite you. Don't take offense to it but we've been doing it a long time and often it's not a trip for beginners. It's going to be the kind of trip we like to call Type 2 or 3 fun. Where pretty much the whole time we are miserable, long tough days where we are just cranking out the miles, climbing elevation, or getting worked in some rapids and questioning what we were doing out there. Sure after the trip we are going to say we had a blast and would do it all over again in a heartbeat. But the truth is we already know we are going to struggle and dont want to have to worry about you when we just need to focus on our own trip. Doesn't mean we won't take you on a fun weekend trip so you can get your feet wet though! We'll happily teach you everything you want to know, just not on that kind of trip. 3. We collect gear and lots of it. 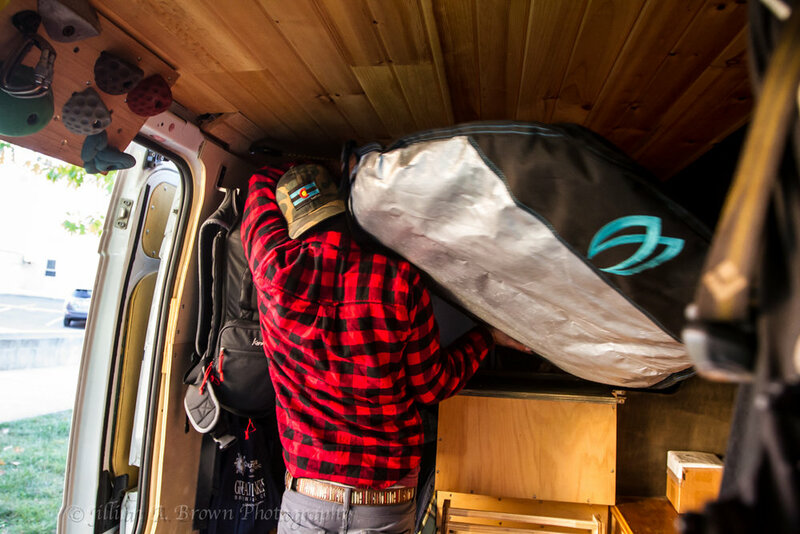 We take up full garages or basements with our camping gear, tents, SUP boards, kayaks, paddles, rock climbing gear. We won't stop either. We'll keep buying more so just have to deal with it. There's a specific piece and size of gear for every kind of adventure. 4. When we buy a new kayak or SUP board, don't ask us to get rid of one of our other ones. This is kind of a red flag that just shows you don't understand us. It's a deal breaker and we don't need that kind of negativity in our life. But to better explain, there's a kayak or board for every type of trip. Example, I have a expedition touring board, race/touring board, 11ft inflatable to run rivers, a shorter river board, ill be getting a competition race board soon, 12'6 and a 14' then you have your all-around boards. Cant forget about SUP surfboards too. Don't worry, we have a specific paddle we like to use for each as well. Yes we need all of them. 5. Our paddling gear stinks. Just deal with it. Our car is always going to have that damp wet clothes musty smell to it. From our water shoes, wetsuits, dry suits, PFDs, to kayak skirts. Stuff gets wet and if it's sunny when we get home, we'll lay it out to dry. But last thing we want to do at 11pm when we get home is unload our gear when we are just going to put it on and get it wet again in the morning. 6. We have no fashion sense. Paddlers are the worst at this. We wear baggy ill fitted dry suits and awkward bootys on our feet but we never care what we look like cause the water is 30 degrees and keeps us warm so we can paddle year round. We have no problem walking into a store for a energy drink wearing it either, kayak skirt and all. Summer time? Endless amounts of board shorts. 7. Every weekend is reserved for being outdoors. When I have to spend a weekend accompanying you to someone's birthday party that I don't know, all I can think about is how I wish I was on the water. Doesn't even matter if I did have fun...i would of had more fun paddling with the guys and just feel guilty I let a beautiful day get by without touching our paddle to water. Sure it's always fun, but we want to progress, practice our craft, or try new tricks we've been thinking about. 8. Too carefree for our own good. We can spend everyday waking up in a tent or hammock, go days without a shower or working toliets. We don't need running water. We are fine with eating dehydrated meals everyday. Ramen is still just as delicious as it was when I was 13. Point is we don't really need all those little things people take for granted cause we're used to living without them. So when electric goes out, or hot water heater quits working...dont expect us to jump up to fix it right away. We can be resourceful though and will cook you an amazing dinner over a campfire out back! 9. Communication while away is never going to be good. We are often in some gorge where there is no cell service. And if there is service, our phone is in a drybag, strapped to the deck of our board or in a kayak dry hatch as we are paddling through a rapid and the last thing we are going to do is answer a call or text. If we are on a multiple day adventure, our phone will be off to conserve battery power for the evening so we can download all our gopro images to our phone. If we do have service, we will try to give you a nightly call....well unless there's a campfire and PBR. Then we are just enjoying our company and surroundings. 10. Social Media is for adventure photos. Some of us are ambassadors for gear companies so we try and post only paddling or adventure inspired high resolution well shot photos to build our network and following. So we are not going to post that blurry couple selfie we took while in the chipotle line last week. 11. We are usually broke. All our money goes to trips, travel, gear. Even if your adventure athlete is a pro. He (or she) is not making big bucks unless maybe you're dating a world class famous athlete who is off competing and winning every weekend. But 99.9% of the time, gold diggers should look elsewhere. Still wanting to date an adventure athlete? Good! Cause we are still great people and crave emotional connection just like everyone else. Just know we are wildly independent creatures and put our heart and soul into everything we do. Don't try to change us, but accept us for how we are. We don't have to share every adventure together so space is important. The time away is good for us to grow as individuals and gives us a chance to miss what we have back home. "I wish I had your life"
"I wish I had the money to do what you do"
"wish I could take the time off to do all that stuff"
I hear it often time when I run into someone I know and haven't seen in awhile. They just tell me how envious they are after seeing all my photos and that they live vicariously through me. But it never makes sense to me so I always reply with "you can do it all too." Of course there's the endless amounts of excuses or reasons why they can't. But I always say, you can have any life you want. Your life is in your hands, do what with it as you will. It doesn't take much money at all either and I work a regular salary job and get vacation days just like everyone else. So here's how I make the most of my time here on earth and travel as much as I can collecting memories. I do own my company and I am luckily how flexible I can make it but I do limit myself to about 4 weeks of vacation time a year and rarely use more than 5 days at a time. The average American vacation time is 16 days per year. (France and other European countries is 2 months vacation) So here's how to use it wisely. Plan your trips around days where you already have 3-4 day weekends. If 4th of July is on a thursday, more than likely you are getting off both that thursday and friday already and with the weekend, thats 4 days right there and you havent even dipped into your vacation time. Why not request the days off before and just start the Saturday before. You'll have 9 days off in a row and only use 3 vacation days. You can go on one hell of an adventure over 9 days so plan ahead! Most of my trips are planned at least 6 months ahead, sometimes 9-12 months. Far as money goes, most of my trips are backpacking or doing an expedition SUP paddle down a river, or maybe it's just spending a few days rock climbing somewhere new. The great thing is, the only real expense is getting there. If you're flying, I highly suggest a credit card where you earn miles. Check ticket prices everyday and usually on tuesdays 6 weeks out is the prime time to purchase when flight prices drop. If you're driving and got 4 empty seats, grab some friends and split the gas! Stay at campgrounds and tent camp. It's never very much, especially if you're splitting a site between a few people. You also get to meet tons of other like minded people doing the same thing you are! 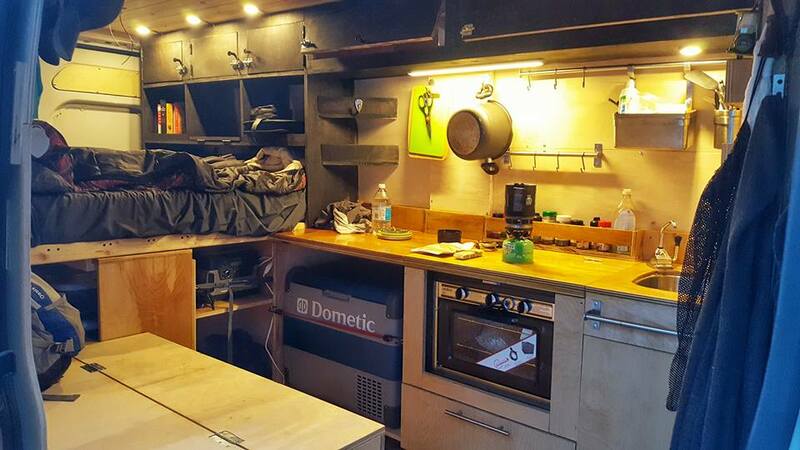 Hostels and Airbnb are also great resources to use. I try to meet and stay in contact with everyone I meet so I now have friends all over the country and beyond I can meet up with or potentially stay with in the future. Sure you may eat out while on the road but while on my trip, Im usually using my backpacking stove so i'll be eating dehydrated meals I prepped long before the trip. Just eat smart and not waste money on over priced restaurants. A cooler in the back with food is also another convenient option. "But I have the kids" I hear a lot. Pretty simple, Take them with you! 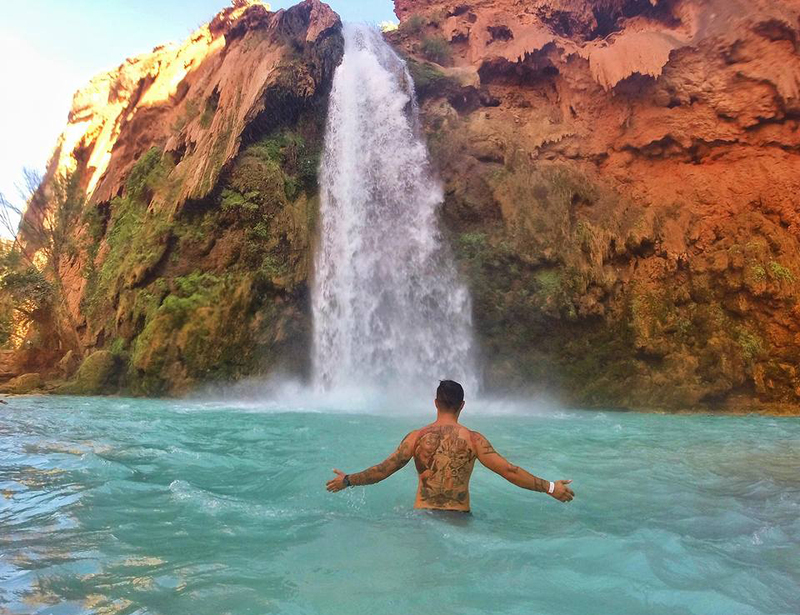 While backpacking at Havasupai, there was plenty of small children backpacking in. Even a few babies. Sure I made sure to camp far away from them but they were still out there, showing their kids these beautiful amazing places! They make some amazing baby carrier packs now a days specifically made for backpacking. Your kid is going to get more knowledge and life experiences joining you on these adventures rather than at home sitting in front of a TV. Start em young! So I ask, what's really stopping you?! There's a whole world out there. Go enjoy and experience it!